After a fabulous dinner at Nemo, one in our party asked if we would like a nightcap before heading to our hotels. Why YES! His question was, "Do you just want a drink, or do you want to be fabulous while having a drink?" Is there any other answer besides being fabulous? 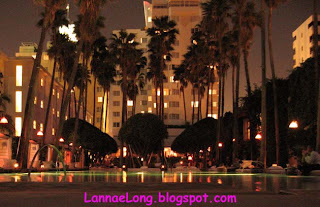 We then headed off to the Delano Resort Hotel on 16th and Collins. 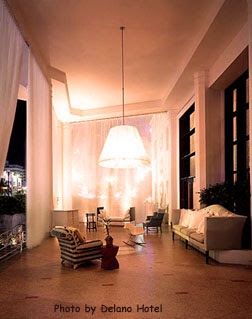 When we got there, we were met with a marble floor porch with fabulous eclectic seating. Hey Bubba, this porch couch takes furniture on the front stoop to a new level. 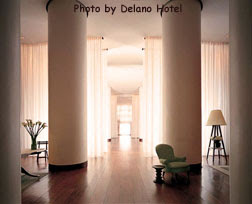 We entered the foyer, and it was a long hallway with floor to ceiling white billowy curtains that brought a new fabulous seating surprise at every turn. I thought I was fabulous sitting in each chair. 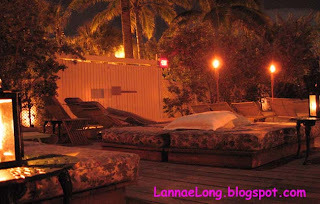 Then, we emerged through the long hallway of fabulous seating, dining and drinking, to the fabulous pool. The fabulous pool is lined with fabulous pool beds to lounge on while having the fabulous waitstaff bring beautiful and fabulous drinks. On our way out of our fabulous time drinking fabulous drinks, and fabulously lounging by the fabulous pool, we came across the longest fabulous chaise lounge. It was a nice stop over before heading out the the door. 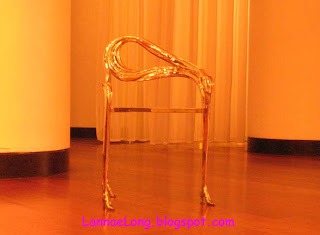 There was the fabulous golden chair to sit in if the fabulous longest chaise lounge was not going to be enough of fabulous. And there was the fabulous really big bench too, next to the fabulous phone to call the cab to take us back to the less than fabulous inn we were staying in. Ever since I have been reading Where the Locals Eat, and having tried the sister restaurants Shoji and Big Pink, I have been wanting to try Nemo Restaurant on the southern most end out South Beach, Miami. Where the Locals Eat summarizes the ranking of the top 100 restaurants of where the locals eat, and the three restaurants are on the list for Miami. Big Pink is a delicious diner and deli, Shoji has the best raw and sushi bar I have ever been to, and the last of the last one to be tasted was Nemo. Nemo is a seafood restaurant next door to Shoji, and is so far south on the South Beach strip that it is chic and calm at the same time. When I was in Miami last time, I went to Shoji twice because the fish was sooo good, and they had wild hamachi that was flavorful and melted in my mouth. The sushi chef really knew what he was doing with regards to trimming the fish, that every piece melted in my mouth. At Big Pink, it was the best diner fun food I have had on Miami Beach. I am sure that it was Michael Chefetz (co-owner of all 3) brain child to have a little NY deli and diner food available to him while he is in Miami, and away from his former home of NY. Whatever Top Chef says about tuna tartare being completely overdone, and trite, I don't care about. I started my dining whirlwind with the tartare, and I enjoyed every bite of it. I liked the raw quail egg for the rich smoothness, and I liked the tartare that was not heavily seasoned which allowed the true flavor of the tuna to come through. 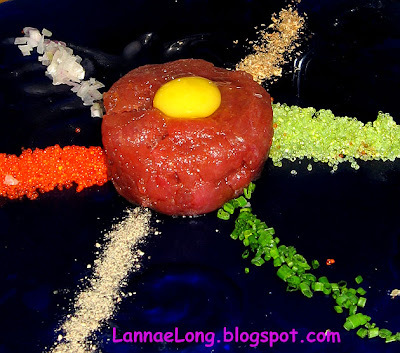 As I got back from my Miami, I saw Med Cooking's post about tuna tartare, and similar ingredients. I like looking at her tuna and my tuna, so I can remember how yummy this dish was. 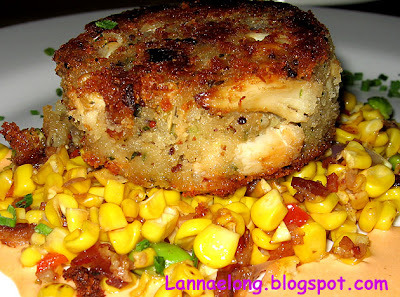 My dinner companion had the crab cake for and app with fresh corn under it. I love corn because it reminds me of summer, so it made me happy to taste the fresh crispness of the corn salad. 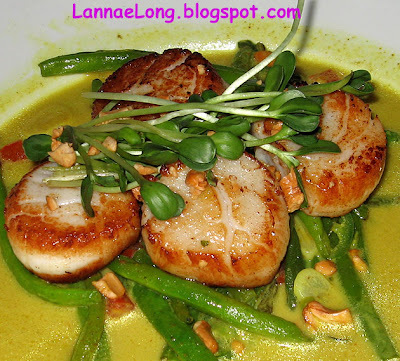 I had the scallops with baby green beans in curry sauce for my main course. The curry sauce was light and spicy, and went well with the perfectly seared scallops. 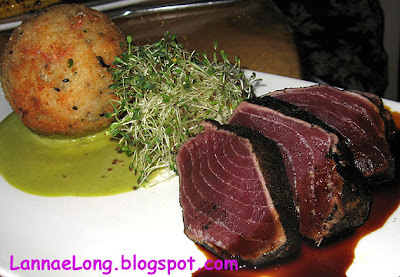 Funny, I was just checking out Med's Cooking again, and she just had a blog post about searing scallops. How funny to see her seared scallops as I remember my lovely, perfectly cooked and presented scallops. Everyone at the table tried the scallops and were impressed, just like I was. The green beans were awesome! They were cooked to crisp tender deliciousness. My dinner companion got the seared tuna with rice ball. I enjoyed my bites of his meal, but he was having a hard time with it. The tuna quality was fantastic, but it was covered in sweet kabayaki sauce, which overwhelmed the delicate flavor of the fish. He said it was ok making combination bites of rice, wasabi (real wasabi root, not horseradish root), and the tuna after scraping as much sauce off the tuna that he could. Perhaps the concept would be better with a small dish of the kabayaki sauce on the side, so the diner could regulate the sweetness themselves. I was just excited to see what the rice ball was all about. I was going to order it to see what the heck it was, and it was a ball of sushi rice deep fried and rolled in black sesame seeds. It was really fun! Hedy Goldsmith, pastry chef of all three, Nemo, Shoji and Big Pink has really out done herself with the key lime pie we had. Hedy is originally from the City of Brotherly Love, and she certainly showed a lot of love with this pie. I generally don't like pie, especially cream style pies, but I really like this pie. 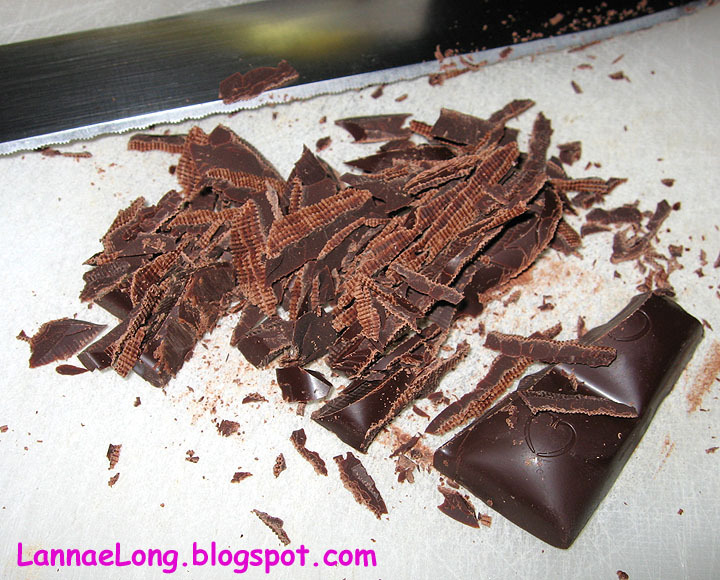 It was tart, firm and light, and had such an intense flavor. 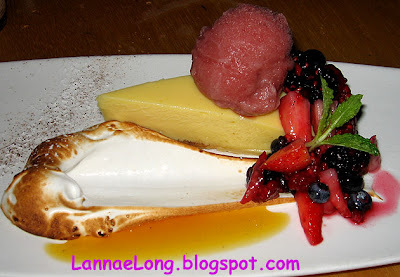 There was fresh berries, torched meringue, berry sorbet a la mode and key lime sauce accompanying the pie in such a wonderful way. If I weren't so full, I would have ordered a 2nd one. 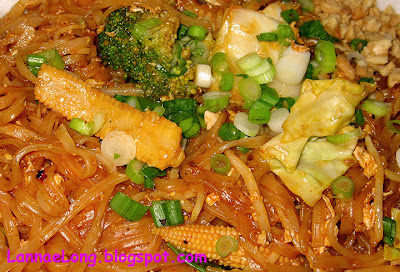 Thai Kitchen is a great little Thai take out place located in the outskirts of 100 Oaks. It is across the busy street from the Wendy's and next door the the 12 Oaks Motel on Brandsford. I think it is in the same building as a Subway. But I do know that it is in the old Rice Bowl location. The owner is Thai and used to cook at the Siam Cuisine on White Bridge years ago, when Siam was the best Thai food in Nashville. She saved her hard earned money and moved on out on her own. A co-worker of Matt's was born in Thailand, and at one time he moonlighted at Siam Cuisine with the owner of Thai Kitchen. He said that her cooking was the real deal, and reminded him of home. When she quit Siam, he quit too because it was not going to be the same. With his resounding endorsement, about having authentic Thai food, I had to try the Thai Kitchen. For now, I have to say that this is my favorite Thai takeout place, and it is fairly close to where I live, so it is convenient to me. The food that I have gotten here are the tom ka soups which are awesome! I have gotten a mushroom and baby bok choy dish which Thai kitchen uses a type of dried Chinese mushrooms and it tastes like my grandmother cooked this dish, it is that authentic East Asian. I have also gotten Pad Thai and beef in peanut sauce. I think she makes her own Pad Thai and peanut sauce because they taste real, unlike some of that industrial made corn syrupy fake sauce stuff. 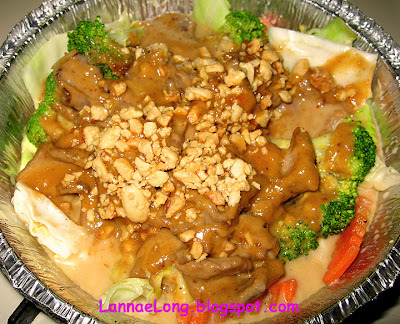 I am actually stuck on the peanut sauce, and the last few times I got take out, I got the peanut sauce. I could drink the stuff if Thai Kitchen would let me. The place does not look like much, and the A/C seemed to be broken all summer. But then again, most awesome hole-in-the-wall East Asian eateries in Boston, Los Angeles, San Francisco, and New York all seem to be a bit shabby looking, have an HVAC problem, but deliver awesome authentic chow. This places kind of reminds me of a hole-in-the-wall basement restaurant in New York I went to. Couldn't tell you the name, but it rocked. Thai Kitchen is cheap, fresh and some of the dishes are quite authentic. It saves my hunger in a pinch when I don't want to cook. Our life is frittered away by detail... Simplify simplify. Henry Thoreau. Last month, we were invited to a different sort of party. Our former next door neighbors finally sold their house (to down size to a smaller home), and they were having a key passing party with our new neighbors. The house was still staged with some furniture, so the dining table was transformed into the goodies table, and the picnic table in the screened-in porch became the bar. It was a nice way to get the new neighbors to meet us neighbors, and to let them know we are a friendly street, fairly devoid of any desperate housewives. I decided I wanted to bring a dish because the former neighbors are a couple of the people we did potluck cookouts with all the time, and I wanted to have one last potluck hurrah with the neighbors. 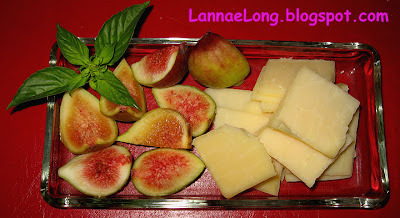 Quite simply, I made a fresh fig and aged cheddar dish. The figs were locally grown about 3 miles from my house at someone's house with 2 mature fig trees. They are of a greenish yellow and red variety, and have a lovely fresh sweet flavor with an delicate fig nose and slight crunchiness from the fig seeds. This variety is more flavorful than the common black ones. It was a one shot deal for this figs and a complete surprise to even have them. During the spring with the April freeze and the summer 12 week drought, all the fig flowers will killed, and the fig trees had no spring fruit, and we thought there would be no local figs this year. Luck for us, one day this fall, the trees gave fruit. To go with the figs, I placed slices of locally made Kenny's Aged Cheddar with a nice sharp taste and rustic and smooth texture. To taste each of these separately is very good, but to alternate bites of each is just out of this world. The saltiness of the cheese brought out the sweetness of the fig, and the sweetness of the fig brought out the pungent aroma of the cheddar. It was simply magical. As I walked around the house offering up the the treats, I caught one man chatting, and he mindlessly picked up a fig and a slice of cheddar. He mindlessly bit into the fig. Instantly he stopped in mid-sentence and took notice of me holding the figs and cheese. There was a sparkle in his eyes, a smile on his face, and he took another nibble from the fig. He said that this fruit was amazing! He had left the present time for a moment, and was transformed back 40 years ago when he was a kid. In the summers he used to play outside all the time. He would get to go to the neighbors house and pick and eat as many fig fruits from their tree as he wanted. He happily did as any child would when given carte blanch to a sweet treat. The neighbors moved, the new owners cut down the fig trees, and the man's youth faded into the background as he aged and made new memories. That instant of tasting the fig, took him back to that simply magical time of his life. Simplify Simplify. Look at what a simple dish can do. I work a job like many people work, M-F 8-5, and then I try to get in some house maintenance, exercise so I can run a marathon in April, write Xmas cards, wrap gifts and box them up to send to my family living in all parts of the country, give the cat some attention, scoop the box, watch Kid Nation, get my lunch together for tomorrow, set up the coffee maker, do some laundry, get rid of junk mail, try to get Toys for Tots and do other volunteer stuff, finish up my leadership development course work at a local university, then blog about all the wonderful food adventures I have everyday. 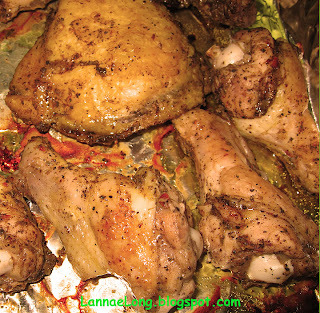 As I spooned the Jerk seasoning into the baggie, I was careful to not touch the chicken. The spoon was covered in Jerk seasoning, so out of habit, I licked the spoon before putting it in the sink. I said outloud, "That's hot! PHEW!" But since it was just a little, the burn did not last long, and the all spice and nutmeg aroma stuck in my nose. When the chicken was done baking, I took out 4 drumette wing pieces and put them on my plate for dinner. Well, the first one was hot and spicy, but not too hot. The aroma of the aromatic spices and onions was fantastic. I ate the second wing piece, and it was getting spicier, and I started to feel warm. By the third wing, I gotta tell ya, the top of my head started to sweat! LOL! I had to go put a dab of honey on my tongue to help settle the burn. Then, it was down to wing 4. I had to wait a while for the burn to settle, maybe a few minutes at most, and I was happily ready for wing 4. I am very impressed that a hot and spicy seasoning holds up to its name HOT and SPICY! We love this seasoning! We do like spicy hot food, and this Jerk seasoning delivers a punch. I think that a little Walkerwood Jerk goes a long way! Next time, maybe 2 tablespoons instead of 2 heaping tablespoons to marinade the chicken would work out well. Until next time! Seasoned Eatings everyone! After the horrible lunch experience downtown at a new eatery, I needed a little pick-me-up, so after work I stopped on in to the Fat Straw on the way home for a little treat. I first heard about Fat Straw this weekend, and I was so thrilled to know that Nashville has its first real Bubble Tea place! Bubble tea is a drink with giant tapioca pearls in it. Bubble tea is sipped with a giant straw and every sip you get a round tapioca ball, the texture of a soft gummy bear, to make a really cool textural drink. I love these things. Bubble tea is all the rage in Los Angeles and Chicago, and in China. When I was in Chicago a couple years ago, in the middle of winter, and I found myself standing in line, outside, everyday for a bubble tea. I was not the only fool standing there freezing, there were plenty of people out there with me waiting for their little treat. 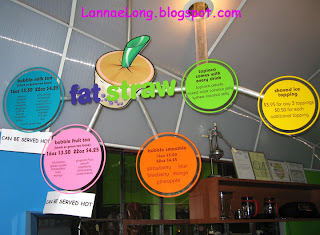 When I got to Fat Straw, I already knew what I wanted. I wanted something with mango. I ordered an iced mango green tea bubble tea. How Scot made it was adding mango juice to iced green tea, then putting it in a shaker, and then putting the shaker in the shaking apparatus, and away it shook my drink. He poured my shaken drink over my boba (giant tapioca pearls) and gave me my drink. 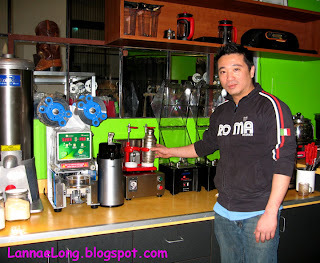 I sat at the bar, and had a nice chat with Scot to find out more about him and his business, and find out what combinations I could get in bubble tea. I will list some options here: hot or cold. Milk, fruit smoothie or tea based. Flavors like chocolate, peppermint, mango, raspberry, lychee, peach, pineapple, strawberry, blueberry, kiwi, passion fruit, honeydew, coconut, banana, papaya, taro, avocado, almond, red bean, apple, and others. The combinations are endless! Next time I might try an avocado, chocolate hot milk bubble tea with no tea. What do you think? I sat at the bar, in this hip place. 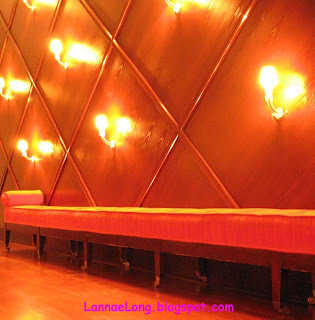 I love the Soho feel about the place, with cool couch, wi-fi, and lucite bar stools. The bar is an old wood bar that adds to the visual grounding to all the other new wave seating and wall decorations. While I sat there, I told Scot that I really wanted to blog about his business, and I wanted to know more about him. When we chatted while sitting at the bubble tea bar, it reminded me of chatting with a bartender at a bar, but being completely sober and getting a bit hopped up on caffeine from the iced green tea. Scot was so nice, and open about why and how he got to Nashville. He has only been in Nashville for 6 months from L.A. Him and his business partner Monica, also from L.A., quit well paying jobs to come to Nashville and open this business. He had been to Nashville many times to see an old friend of his who moved here, and he kept on thinking there was a need for Bubble Tea. Scot knows about a lot of other Bubble Tea places in Taiwan, L.A., San Francisco, Boston, Chicago, Austin, Houston, and San Antonio, and he really believes that Nashvillians will fall in love with Bubble Tea just like the rest of these places. He said that Nashville has been really great to him, and has welcomed his bubble tea with open arms. That is great, I thought, because I want lots of people to love bubble tea like me, so his business can be here for as long as I am addicted to bubble tea. OK, so I had a little chat about where the name Bubble Tea come from, because it can made without tea, and what is up with the bubbles? 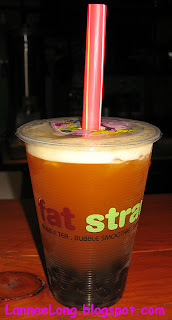 What I have heard was that the word for giant tapioca pearls is BOBA in Chinese, so it was called Boba Tea when Bobas were added to iced tea in China. When this drink finally made it across the pond from China, the phonetics turned Boba to Bubble Tea. But, Scot has offered up another version of how Bubble Tea got its name. He said he knows the guy in Taiwan who invented the Bubble Tea shaker machine, and said the original drink was iced tea with sugar shaken a ton, then poured in a glass with a thick layer of tiny bubbles, thus the name Bubble Tea. Scot said that the tapioca pearls came later. Another explanation was that the tapioca pearls getting sucked up in the straw looks like bubbles, thus the name Bubble Tea. What do you think? Let me know what is the origin of the name Bubble Tea. Since we live about 5 blocks from a Sonic, Matt decided to drive on out there so we could give these little treats a try. Sadly, they are kind of exactly what I would hope for in a deep fried treat. If mac and cheese were not filled with fat as it is, deep frying sealed that deal. These creamy and oowey on the inside, and salty and crunchy on the outside treats are really good. Matt got a little bit of that heavy stomach feeling because we don't eat deep fried foods that much, but for the most part I have an iron clad stomach that took on these snacks with and iron will. 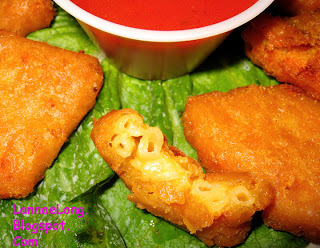 I love mac and cheese, I unfortunately loved these little things. Good thing I normally don't go to fast food chains, and I won't be going back to get these too often, but maybe once or twice per year. I guess I spent my twice per year because I went back on the day after to get another serving of these sinful little deep fried mac and cheese bites. After day two, I had to stop watching the commercials for these things, and stop eating them. 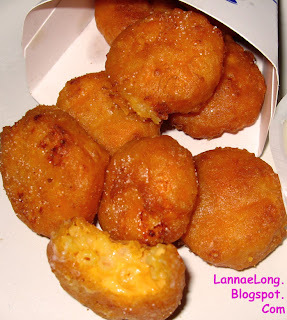 Apparently fried mac and cheese things are a "thing" here is the south. There is a little restaurant on 5th and Church downtown that has these things on their menu too. During the 1st Saturday Art Crawl Tazza had an art opening of their own, and they were open until 11 pm for us who wanted to get a bite to eat after art crawling for 3 hours. I am not a big fan of Tazza because the food is mostly Sysco Food Distributor food that the kitchen staff (not a chef) assembles. The food works in a pinch for hungry art gallery hoppers like us, but under normal circumstances, it is just another restaurant no better than mid-line chains like Fridays or Applebees. At anyrate, this week of eating mac and cheese, I had to order Tazza's version of deep fried mac and cheese. It is obviously pre-made by the food service, frozen in little triangle shapes, and all Tazza had to do was dump some into the deep fryer. These things were crunch on the outside, with mac on the inside. The order was ok, but since eating the Sonic fried mac and cheese, my mind actually turned to the Truffled Mac and Cheese from the Capitol Grille. Those 2 fried mac and cheese things piqued my appetite for the holy grail of mac and cheeses: The Capitol Grille Truffled Macaroni and Cheese. This stuff is sinful, full of fat, full of cheese, full of white pasta noodles, and full of flavor and aroma of truffles. Yes, there are a few macaroni and cheeses I like a lot, but this one is the one I adore and dream about. As the story goes, I stopped by the Capitol Grille for lunch on that week's Friday, and I got the dreaded news. The Capitol Grille only makes their famous Truffled Macaroni and Cheese for dinner, not for lunch. Yeah, they just need to have this mac and cheese all day long, breakfast, lunch and dinner. I walked away disappointed. What I ended up doing for lunch was getting a Stouffer's frozen mac and cheese, and it was good for what it was, but it was not the Capitol Grill. So, the next Monday, after work, after thinking about the Capitol Grilles yummo mac and cheese, I stopped up at the Capitol Grille on my way home, made a bee-line to the Oak Bar to order, and placed my order for this yummo goodness. The rest is history. See the previous Seasoned Eatings post. It really was a good day on the day that I enjoyed my takeout order of the best macaroni and cheese in my world. Seasoned Eating is here! aka a Good Day! It is a good day! I treated myself to a giant order of the best takeout mac and cheese from the Capitol Grille. 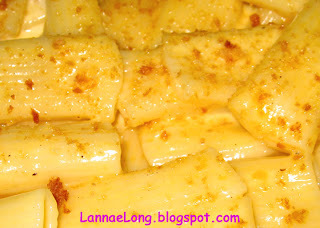 It is flavored and perfumed with truffle oil. As the wait staff came out of the kitchen with my container, she mentioned to the other wait staff that the dish just smelled amazing! It did, and it tasted just as great too. I drove home with this fragrant treat in my car, I admit I might have sped a little to get home a few seconds earlier to dive into the best mac and cheese. BUT THEN, I went to the mailbox and found a spicy packaged addressed to me! Wheeeee! Could this day get any better? Seasoned Eatings surprise package! What could it be? I got to participate in th Seasoned Eatings spice exchange that Country Girl hosted, and Thyme for Cooking co-sponsored from across the pond. The idea is to send a food blogger and food lover a spice that is of your cooking, or of your region of the world, and wait for another food blogger and food lover to send you their specialty spice. When I stepped into the door, I quickly opened the mac and cheese and tasted it, then I broke into my package! Ooooh do I like surprise packages involving food! The containers wrapped so pretty! I took out the wrapped containers to show you what I got! Look! It is two wrapped containers! 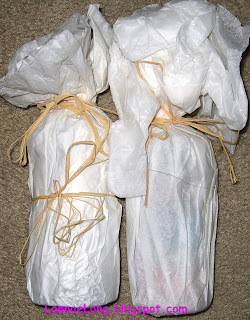 Deb from Debskeywestwineandgarden sent me, not only these 2 pretty wrapped spice gifts, she sent to me a lovely letter that felt like an old friend was mailing me. Deb sent to me bunch of recipes and a lovely magazine showcasing Key West through walking and biking! 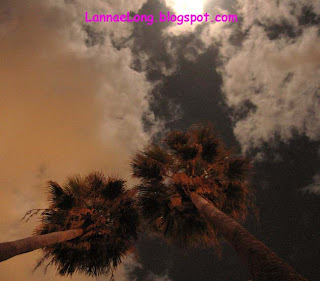 I have never been to Key West, but I hear how wonderful it is. Deb confirmed that. Deb is originally from Ohio, a more snowy area of the USA, and now she is enjoying the tropical breezes of Key West and the spicy foods that come with the region. As I read her letter over and over, and look at the magazine, I am thinking about my annual Xmas warm get-away. We are cruising to Mexico, with a Christmas morning stop (4 hrs) in Key West, and it will be my 1st time to the Keys. How fortunate, and what a coincidence that Deb lives there and has sent such a lovely and warm preview of a great treasure of Florida! What a great day for me huh!? 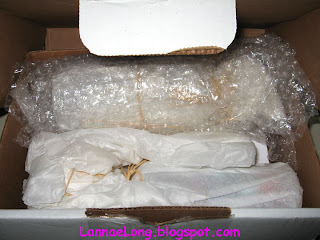 On a tangent, when I sent off my package, it wasn't so pretty as the one I got, and it was a bit utilitarian. I wrapped the containers with plastic grocery bags, used bubble wrap, paper, and package pillows to wrap up the spice, and I included only one recipe, and I did not include any letter, just my name and website. I want to tell my secret spice person that I love making that recipe I sent. I love that recipe, and I know it by heart. It is completely comfort food for my household. Seeing that I live in the South USA, I could not send the common flavoring (that would be salt pork fat, pork fat, or smoked pork fat and it would be rancid by the time it got there), so I had to send what means home cooking comfort, a spice that is umami and homey for me. I hope that my secret food blogger likes it as much as I like getting my tropical spices. The suspense of what it is, is over! 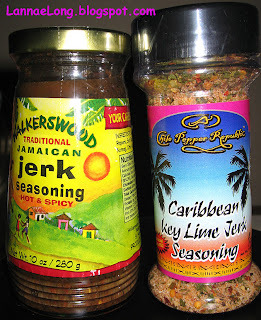 I got Jamaican Jerk Seasoning and Caribbean Key Lime Jerk Seasoning! This is amazing! I have never used Jerk Seasoning before! How fun is that going to be? I am thrilled, I love my new spices! Thank you thank you thank you! Since I work, I don't cook all that much during the week, but Deb sent me the easiest recipe in the world. Check it out. Put the meat in a sealing plastic baggie, put a few tablespoons of the Walkerswood Jamaican Jerk Seasoning in baggie, enough to coat the meat. Close it up, put the baggie in the fridge for hours. Later, light the grill and cook! Sweet! Matt does all the grill cooking, so I am completely off the hook to cook there, and I get to make other things to compliment the Jerked food! How fun! Now I must contact Deb and here wine blog part of her blog. What wine would go well with Jerked food? I picked up some Napa Buehler Zin and Russian River Chard (un-oaked), and some Green Lion Cab (Robert Parker gave it a 100, what a steal at $19!). Would any of these go with the Jerk spices? Stay tuned in the next couple of weeks for what I get to cook with these fun new spices to my pantry, I will be blogging about it! I never turn away a good hot choco/cocoa. I went to the super secret place to get hot cocoa the other day, and usually it is made with dark choco, cream, whole milk, a dash sugar and a huge homemade fluffy marshmallow on top. This is not on the menu most of the time, it is one of those items that you just have to know about. 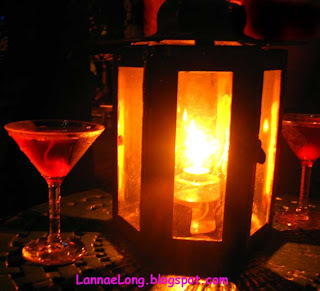 Usually, it is like sipping on the most decadent warm treat the world has to offer. Then, the other day, the chef was not in, and I ordered my super secret hot choco for dessert. What came out was a pale skim milky, sugary (too sweet), lack of choco depth, lack of choco flavor profile, lack of creamy texture, and a stale stiff marshmallow on top. It was also lukewarm to start, and there is nothing worse for a cup of hot cocoa than to start out as old dish water temperature. I was so disappointed. It was like walking into McDs to order French fries, expecting this pouch of hot, salty, hot greasy, crunchy on the outside, fluffy on the inside, addicting little potato sticks, but then what they give you is a pouch of cold, floppy, gummy, BK type fries. 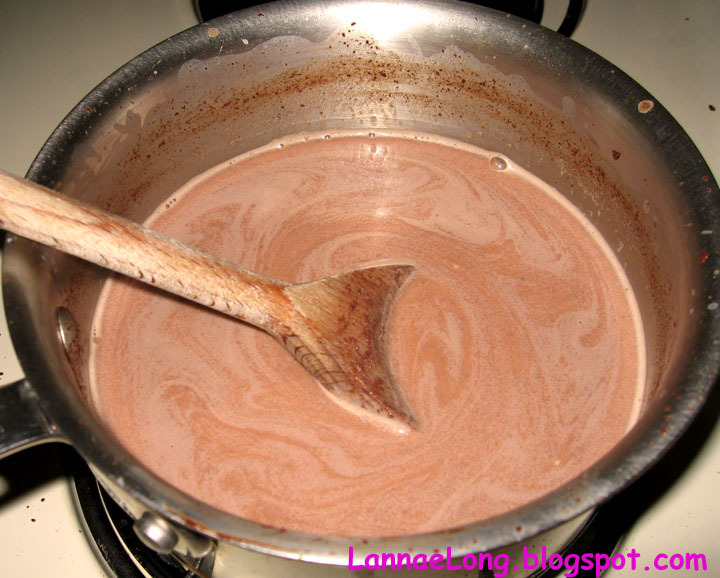 The next day, to remedy this want of great hot choco, I decided to make it myself. Hold on to your arteries, here is what I did. I got some Hatcher Dairy cream and whole milk. 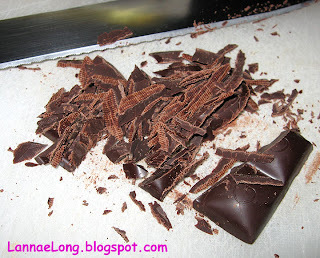 I took my giant choco bar that I got for taking the new Whole Foods opening tour, and cut up 3/4 of it in tiny pieces. I also used a few drops of honey from my honey bear that was packed with locally produced honey from my friends house. The story behind the honey is that a tornado came close to his house, knocking down a tree. He discovered the hollow part had bees, so he tried to prop up that broken bee home so the bees could live. Well, it was no use, the tree was smashed and opened to the elements. He was so sad for the bees because the high winds and the storm destroyed the bees' home. He hurried to get help from a bee keeper, and they quickly built a man-made beehive and placed it right next to the broken tree home. Well, to the happiness of my friend, the bees figured out they had a new, and safe home, and they moved into their new abode. His bees in his back yard were prolific this year, and made honey like nobodies business, and I was lucky enough to be able to get some of this sweet gold. These bees are happy, safe, and well looked after by a very kind man. OK, so I warmed 2 cups milk, 1/2 cup cream, 3/4 bar of dark 70% choco, and a few drops of honey in a pot. I kept stirring and stirring until really warm. This made 2 servings. Yummo! I am good now for hot choco.